Judy Higgins will be your capable and fearless leader. Here are the tunes we’ve been playing over the last year. Some of us have been getting together to play tunes on (usually) the third Sunday of the month in our first home, the Leadway. The kitchen is open. There are a good selection of beers on tap. And the sound is good. It’s easy to hear. We’d love for anybody to come play along with all or some of the tunes — or even just sit and listen. All instruments are welcome. We’ll work on that single jig that Jimmy Keane, Jr. taught us at the January concert, Jack Murray’s jig. and Barres de la Prison, from David Greely. 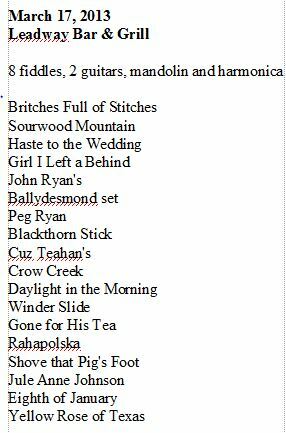 Click month for a list of tunes we played at recent jams. We’ll be in the front of the bar this month. (The movies of Quebecois fiddling promised earlier are postponed to a later meeting.) Still, there will be tunes aplenty. 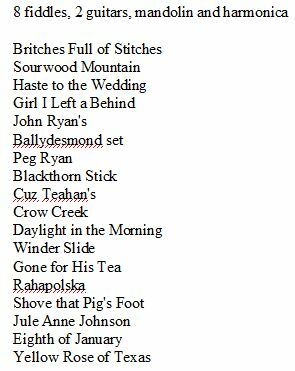 Here’s an abridged list of Fiddle Club tunes that have been and should be played. 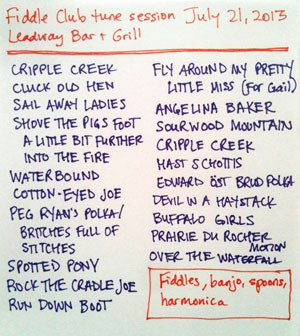 Even if you don’t know any of these tunes, come join us anyway. We’ll work them into shape gradually. Plus, we always play a lot of favorites and standards. Koputus polkka from Arto Järvelä’s month long residency in 2009. 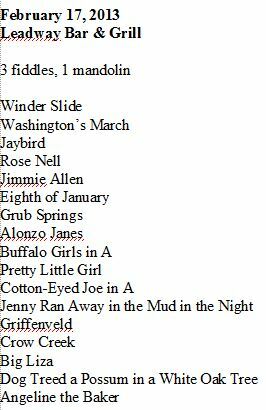 A longer list of the Fiddle Club’s repertory can be found here. Come check out the Atlantic. It sports a comfy seating area up front and a fabulous back room. (Also, good beer and food menus.) The owner and manager like having us there. With a good showing, we’ll be able to consistently reserve the back room. Plus, a new way to support the Fiddle Club through several dues options will be announced in this space very soon. Sept. 19 at 6:30 at the Leadway Bar & Gallery (5233 N. Damen). We’re going to play tunes. Any tunes you want. I plan to start some from this list. This session is open to all fiddlers, players of kindred instruments, and appreciative listeners. No dues to pay for this meeting. No need to register. Looking ahead, our next three meetings will be held in the back room at the Atlantic Bar & Grill (5062 N Lincoln Ave). The meeting time will be 6:30 on a Sunday evening. The dates are October 24, November 21 and December 12. Vesta Johnson, a fine Missouri fiddler, along with her grandson Steve Hall, will be our featured guest. There’s a wood floor at the Atlantic. We might dance a few old-time Missouri squares. That will make Vesta feel at home.